A rarity, I had spent the night exactly where I'd returned to the previous day, about 2mi up the dirt E. County Line Rd above Buckhorn Summit on SR299, west of Redding. It's not often that I use the same TH for two successive days. I was in the Whiskeytown area chasing CC-listed summits and had 2-4 on the day's agenda, depending on how well I did. Somewhat to my dismay, I would have to redo the first four miles up E. County Line Rd I had done the previous day in order to reach the turnoff for Shoemaker Bally. Making this more palatable, my mountain bike would allow this to be done fairly quickly. Having left my daypack back in San Jose posed a more significant difficulty - I would have to manage more than 20mi and 7,000ft of gain with only the few items I could carry with me - my hat, a light jacket, a pair of leather gloves and a couple quarts of Gatorade, besides the clothes I wore. Starting off shortly after 7:30a, the sun had already risen over the Trinity Alps to the northwest as I plied the road up and over Buckhorn Bally, walking the bike in places where the road proved too steep. In 40min I had reached my turnoff point at the 4mi mark and locked my bike to an NPS boundary sign. There were no more roads from this point on. Now that I was on foot, I had to figure out how to carry my supplies and manage a little bushwhacking. I wrapped my Gatorade bottles in my jacket and tied it around my waist as a makeshift fanny pack. Crude perhaps, but it worked nicely. My route would go up an old firebreak on the NW Ridge of Pt. 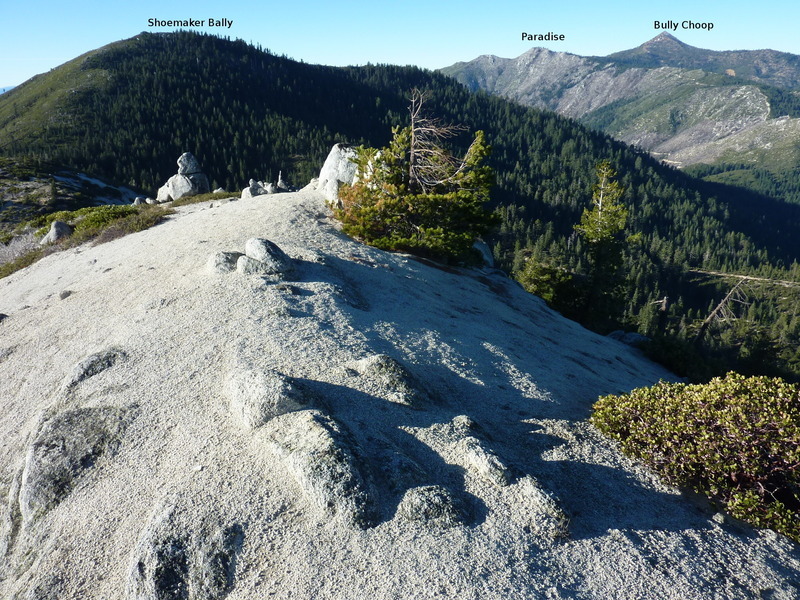 5,625ft following along the NPS boundary of the Whiskeytown Unit. The start is not obvious and one needs to know where to look in order to find it, basically following the edge of the poorly-defined ridgeline. I had this line entered into my GPS and would refer to it periodically to stay on route for the 40min it took to climb the ridge. Views open up dramatically as one climbs higher and I would pause now and then to take photos of the snowy Trinity Alps or the imposing Mt. Shasta behind me. Though it had been quite cold in morning (about 38F, and why I got a late start), it was warming nicely and would make for a beautiful day. It was 9a when I reached the main crest atop Pt. 5,625ft. From here, Shoemaker Bally is a one-mile side trip to the southwest, following the crest down through a saddle before climbing Shoemaker's NE Ridge to the top. I cached one of my bottles here before starting off. The first half of this was easy enough - with open terrain and a downhill slope, it took all of 10min to reach the saddle. An old jeep road (depicted on the 7.5' topo) runs across the saddle but unfortunately did me no good as it was perpendicular to my route of travel. There was some mild bushwhacking needed along the NE Ridge to Shoemaker, but the presence of an old firebreak helped a good deal in places. It was nearly 9:40a by the time I reached the summit atop a rocky perch with fine views in all directions. To the west rose yesterday's Bully Choop while to the east stretched the ridgeline to Little Bally that I would travel next. Behind this ridge rose Shasta Bally and though I would travel within less than a mile from its summit, the topography made it unlikely I would reach there today - still, it was early and I had much optimism. I returned back to Pt. 5,625ft, retrieved my cached bottle and continued northeast and east along the ridge. Good fortune continued as I found the remnants of the old firebreak continuing and what looked like continued use by animals or hunters to keep the track serviceable. In another 40min I had reached the summit of Peak 5,493ft, about 1.5mi from Pt. 5,625ft (my distinction here between 'peak' and 'point' is based solely on prominence - those with less than 300ft are referred to as the latter). It was about 10:45a, and with about 3mi to go to Little Bally and plenty of daylight, my optimism had remained high. But now it suddenly took a turn downward. The nice trail I had followed up until now had given out. I would find no trace of firebreak nor trail from this point on and my progress slowed accordingly. I found more brush than the forest I would have preferred. I was happy to have a pair of gloves but I had to watch over the next 4hrs as my pants took a beating on the rough brush found along much of the trailless sections I traveled. Some forested sections offered brief respites and I was surprised to find some old flagging in places, but it didn't seem to show any defined route, use trail, or anything of thata useful sort. There was also a large gap NW of Little Bally requiring a drop of more than 1,000ft before climbing back up the same amount. The NW side of this gap was particularly steep and slightly treacherous with poor footing in places that caused me to slip several times. The brushiest part of the route then proved to be the climb up from the saddle to Little Bally. The climb up to Little Bally had me pretty worn by the time I reached its highpoint. As on the other summits of the day, I found no register nor any reason to think someone might have bothered to leave one on these obscurities. It was time to take stock of what I was doing and decide whether to continue, so I sat down to rest and consult with myself. Two CC-listed summits were close enough that I could taste them. Ducket Peak was 2mi to the south with a 1,000-foot drop to a saddle. A logging road from the saddle appeared to go the last mile most of the way towards the summit. The drop from Little Bally appeared to be a brushfest I was lacking energy to tackle. 1.5mi to the east was South Fork Mtn with a 500-foot drop to a saddle and no roads or trail of any sort that I could make out. It was 12:45p and I had about 4hrs of effort to return to the car if I started now. If I turned back, I would certainly get back by sundown whereas if I tackled either of the others it seemed even more certain I would get back in the dark. Without my daypack, I had no headlamp and there would be no moon to help, either. Prudence had me turn back. I rationalized that I could get to the other peaks from some other direction, possibly easier than coming back this way - it would be left for a future exercise. As I returned back along the same ridge I had traveled, I looked a little longingly at Shasta Bally as well. Though the distance and drop to a saddle were more manageable, the route looked more brushy than anything I had encountered yet. That summit at least has a road going to its top from the east side via perfectly legal means, so I wasn't much dismayed - in fact I would visit it a few days later. The return wasn't completely routine. As I was heading back up and over Peak 5,493ft I noted that my route took me within a quarter mile of the westside road to Shasta Bally. This little-used road, now only useable by motorcycle and foot traffic, starts at Coggins Park and winds its way in 7mi to Shasta Bally. If I was able to bushwhack my way down the north side of the ridge to reach the road, it would make my return to Coggins Park easier, without having to go back up to Pt. 5,625ft and down the firebreak I'd taken on the way up. More adventure and an easier return sounded like a win-win to me. The initial look off the north side from the saddle was not encouraging - a wall of manzanita at head level greeted me, almost daring me to plunge in. I resisted, waiting for a better opening a short distance to the west, then headed down. More shredding of the pants ensued and more serious bushwhacking than I'd yet done today, but I was helped by gravity pulling me downward (and over the bushes, as needed) and the mercifully short distance required. The road was found exactly where it was indicated on the GPS and as an added bonus I had a small stream trickling down across the road. I had gone through the two quarts by this time and the little creek was a welcome find. I satiated my thirst, filled up one of the bottles and headed off down the road. It was 4p by the time I'd returned to the bike, with just four miles of road work remaining. The uphill to Buckhorn Bally was sapping what remained of my energy stores. As a small distraction, I decided to visit Meher Bally, not a peak but a small inholding in the Whiskeytown Unit. If there was a cabin of some sort on the property I didn't locate it, satisfied upon my discovery of some old adirondack chairs to sit down for a short break. They nestled in a small clearing overlooking Shasta Bally with a small campfire ring that suggested summer evenings in the chilly air with a cozy fire and generous libations. Gatorade would have to do today. Back on the bike I was soon up and over Buckhorn Bally and on the last downhill mile to the van where I arrived by 5p. Mostly satisfied with the day's effort, I was already considering the next day.